Orthophoto generation from aerial images (frame and line sensors), and from various types of satellite imagery (Ikonos, Quickbird, Spot, Landsat, IRS C/D, Aster, CartoSAT and ALOS). Automated processing of single images. 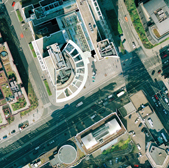 Automated one-step batch processing of complete aerial image blocks; also in batch mode. Projects with 20000 aerial images and more can be processed. Orthophoto generation in pre-set area-of-interest; flexible definition/import of optimal ortho areas. Unique true-ortho capability in combination with OrthoVista; advanced modeling of bridges, buildings and other man-made objects. On-the-fly generation of hybrid grid-based DTMs or TIN models. Exterior orientation of single aerial images by spatial resection. Refinement of orientation data of satellite imagery by interactive measurement of control points. Multi-threading of time consuming processses for efficient use of multi-core CPUs. Optional distributed processing in combination with DPMaster.